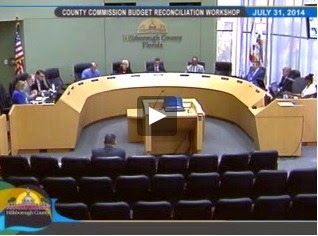 Yesterday, July 31, the Hillsborough County Commissioners met for a BOCC Budget Reconciliation workshop, scheduled for 9am - 5pm. A long day was planned, and the agenda (PDF) was about finalizing the budget millage and corrections from the earlier draft. The transcript and video (if you can get that crap Silverlight working !$%*&!) are here. The Trib reported on the meeting as well. There was an interesting non-budget item added to the Budget Reconciliation agenda, not on the original agenda, created by Commission Chair Mark Sharpe or County Administrator Mike Merrill, to fill an open seat on the HART Board. A BOCC citizen appointee to the HART Board, Anne Madden, resigned on June 16, and the Board needed to approve a new appointee. At a Budget Reconciliation workshop? They have 20 days to fill vacancies accord to the law. (9) Each director shall hold office until his or her successor has been appointed and qualified. A vacancy occurring during a term shall be filled only for the balance of the unexpired term. The first directors shall be selected as provided above. An appointment to fill a vacancy shall be made within 20 days after the occurrence of the vacancy or before expiration of the term, whichever is applicable. If no appointment is made within the prescribed time by the appointing member, the board, by a majority vote, shall appoint an eligible person to the board with like effect as if the appointment were made by the member. However, if the board does not appoint an eligible person within 10 days, the appointment shall then be made by the Governor within 10 days thereafter. Any director shall be eligible for reappointment. There have been 2 BOCC meetings since Maddens' resignation. 45 days is my count. Reading through the statute above, can the Commission even make a legal appointment now? Yet they waited for a Budget Reconciliation workshop to take up filling a HART Board vacancy? They did not follow the law. It is rather unusual to allow public comment in a workshop. The agenda for this Budget Reconciliation workshop was published, and did have an item to fill the HART vacancy, but it did NOT have an agenda item for public comment. When they got to the agenda item to appoint a new HART Board member, Commissioner Mark Sharpe stated "So what we'll do is we'll go ahead and open for public comment.... Seeing no one, we'll close for public comment". No one was there. Well, one dude talked about libraries. No one was there since the BOCC did not properly notice for public comment, since public comment is normally not allowed at a workshop. Perhaps they did not want to hear from the public. Commissioner Sandra Murman, who currently sits on the HART board, nominated Commissioner Les Miller to fill the vacancy. The nomination was seconded by Commissioner Beckner, who also currently sits on the HART board. In an interesting move, Commissioner Victor ("I'm not Charlie") Crist "I wish to appoint Sharon Calvert, a constituent of mine who has expressed an interest of serving on the HART Board. I think her interest and working knowledge as her ability to participate would be an effective member of that board." Sharon has not expressed interest in serving on the HART Board, and never applied. Ken Roberts, a transportation knowledgeable constituent of Sandra Murman's, and from the same South Shore part of the county as Anne Madden, had applied for the position. (Disclosure, Ken is a friend). There were no seconds. Commissioner Sharpe stated his support for Miller, how good the existing commissioners have served, rambled on about the magnitude of transformation upcoming before us, referenced a Booz Allen Hamilton study (PDF) from the TED/PLG proposal. Regarding that Booz Allen Hamilton 2011 study, it was actually a study paid for by the American Public Transit Association, the primary lobbyist for transit in DC, mostly paid by transit agencies, which are largely paid by our tax dollars, to lobby to get more of our tax dollars for more transit. The study had little to do with what is confronting Hillsborough County But we'll save that for another blog. These are writing themselves these days. Les Miller was appointed on a 5-1 vote. Victor Crist voted against. The meeting scheduled from 9am to 5pm was adjourned after about 40 minutes. For one, the BOCC did not follow the law in appointing for the vacancy within twenty days. In fact, they let it lapse for 45 days. Why the rush all of a sudden, when the BOCC needed to cram this appointment in a budget workshop after letting it lapse so long? HART Board is meeting on August 4 on whether to approve the HART takeover plans as proposed by the TED/PLG. The next BOCC meeting is not scheduled until August 6. They wanted needed to appoint someone who will vote favorably for the HART takeover. Les Miller's first vote as a HART board member will be to totally reorganize its mission and kick out most of the other citizen appointees. They engineered it such a way to ensure there would be no publicity and no public comment on the matter. They also engineered the HART Board that is now very Tampa centric. There is now no representation on HART from south and east Hillsborough, the fastest growing parts of the county. There will now be four County Commissioners on the HART Board -- Sharpe, Beckner, Murman, and now Miller. They had difficulty following the law for an appointment, now they want to oversee Super-HART and a $15 billion transportation pipe dream. They are only building distrust. until a couple BOCC members got locked up. ? ?